(CNN) -- Virginia Tech will be fined $55,000 for waiting too long to provide timely warnings about a shooter on the loose during a 2007 rampage in which 32 people died, the U.S. Department of Education said Tuesday. The school said it will appeal. A December 2010 report said the school did not notify students in a "timely manner" -- as dictated by what is known as the Clery Act -- after a shooting that left two people dead at West Ambler Johnston residence hall on the morning of April 16, 2007. The same shooter, identified as Cho Seung-Hui, 23, went to the university's Norris Hall more than two hours later and killed 30 more people before turning a gun on himself. The Clery Act was created in 1990 in memory of 19-year-old Jeanne Ann Clery, who was raped and killed while asleep in her dorm room at Lehigh University. The law requires colleges and universities to disclose information about crimes on or near their campuses. Federal officials said the $55,000 for two violations of the act is the maximum allowed. "While Virginia Tech's violations warrant a fine far in excess of what is currently permissible under the statute, the department's fine authority is limited," wrote Mary E. Gust, director of a department panel that reviewed the case. Larry Hincker, associate vice president for university relations at Virginia Tech, said Tuesday the school "respectfully disagrees" with the fine. "As we noted before, neither the Department of Education nor the Clery Act defines 'timely,' " Hincker said in a prepared statement. "The university actions on April 16 were well within the standards and practices in effect at that time." According to the report and Tuesday's letter to Virginia Tech, police went to the scene of the Virginia Tech dorm shooting at 7:24 a.m.
At 7:57 a.m. police notified the office of the executive vice president about the shooting. President Charles W. Steger was then notified and an 8:25 a.m. meeting was held to discuss the shootings and how best to notify the campus community. The administration knew that no weapon had been found and that bloody footprints led away from the crime scene, according to the education department. But it was not until 9:26 a.m. that the university first notified students and staff by e-mail about the shooting. "The message was vague and only notified the community there had been a shooting on campus. It did not mention that there had been a murder or that the killer had not been identified," the Department of Education said Tuesday. It was about 15 minutes after the e-mail went out that Cho began shooting in Norris Hall. The rampage lasted from about 9:40 a.m. to 9:51 a.m.
A second message was sent to the community at 9:50 a.m. with a "much more explicit warning." "Because Virginia Tech failed to notify its students and staff of the initial shootings on a timely basis, thousands continued to travel on campus, without a warning of the events at" the residence hall, the education department said. University officials disputed the federal findings. 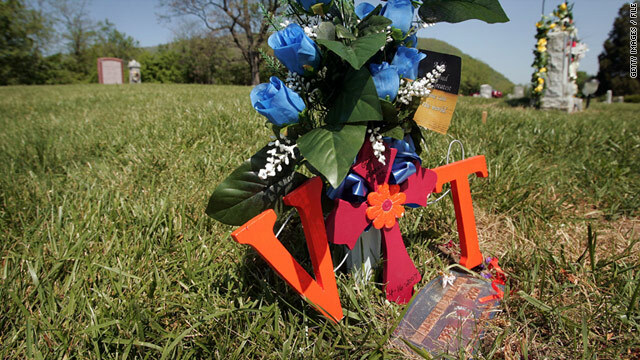 "We believe that Virginia Tech administrators acted appropriately in their response to the tragic events of April 16, 2007, based on the best information then available to them," Hincker said. The university also argued it "is being held accountable for a new federal standard that was adopted after the April 2007 shootings." New rules went into effect in 2008. But in its letter to Virginia Tech, the Department of Education said the school did not meet timely warning rules that were in effect on the day of the rampage. The school also is being fined for not following the warning policy it had disclosed to students and staff, the department said.